"STOP RUINING YOUR WOOL SOCKS", my wife shouted from the laundry room. I've got this thing for spot and stalk hunting, and usually once I've gotten into one hundred yards or so I slip my boots off and finish the stalk in my socks. Another reason in my opinion to wear heavy wool socks, not only are they warm they are quite durable. Still ticks the better half off though. So earlier this year I was looking into suitable footwear, something to help me save socks that would also provide extreme stealth as well as all around protection. Generally speaking there are three types of boots in my closet. Danner, multiple flavors mostly all uninsulated; Schnee's pack boots, and Gander Mountain's 18" Fanatic with 1,000 grams Wool Plus insulation & 200 grams Breath Right Ultra insulation. When it comes to boots, I've gone through more than my fair share in search of the elusive perfect boot. Many have come close but usually just not quite right for everything. Once I accepted that I started buying rather specific purpose built boots. I live in northern Minnesota where temperatures can get pretty extreme on the cold side of things, I also drop into the Dakotas from time to time for mule deer and antelope. Winter before last we hit a new record here, -47F with 35 to 45mph wind. Now that was cold! Back on track, sock saving and stalking. While browsing around there I found a very intriguing story. "Camuks™ rubberized sole style was originally developed by Steger Mukluks for the 1989/90 Trans-Antarctica Expedition. The 6 International members of that expedition team had to endure temperatures ranging from 30 F above down to minus -50 F over a 7 month period. 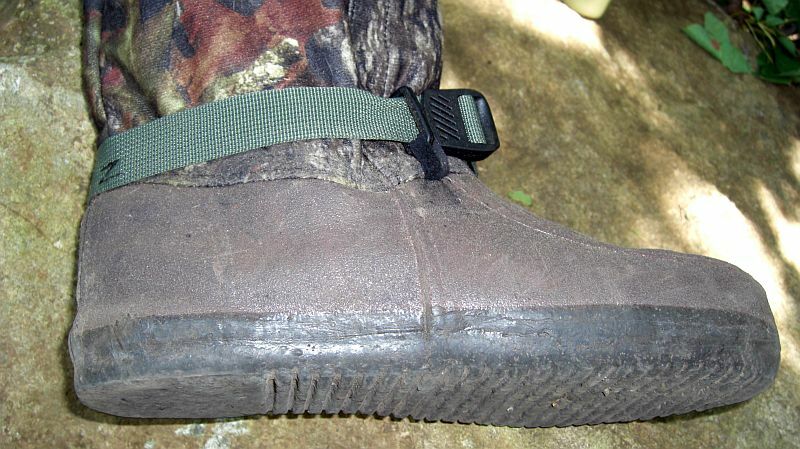 We successfully kept their feet warm and comfortable in these survival boots during this entire expedition. Last fall one of the Trans-Antarctica Expedition Managers contacted us and asked if we would make another pair of the rubberized mukluks for him. He’d been hunting in his original pair from 1989 for the past almost 20 years and decided it was time to ask for an new pair, and by the way....would we put a camouflage gaiter on them with StrapLocks instead of the leather laces and ties? The result is Camuks™. We’ve intensely tested Camuks™ over the past year for durability, waterproofness, blend into the terrain, lightweight, warmth, quiet....very quiet... and a sole that allows you to feel more of the ground than any other boot on the market. 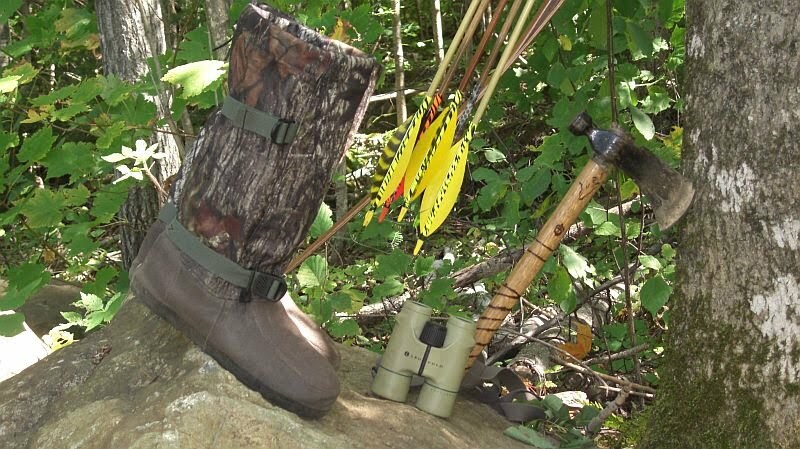 We believe there isn’t another pair of hunting boots or survival boots on the market that can rival Camuks." Well I had to take a look at them, so that weekend the wife and I drove the short drive down to Ely. 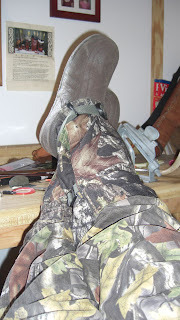 See I was interested in the foot material, rubberized moosehide? They take a moosehide, and apply this strange rubberized compound to it, increasing durability while maintaining superb flexibility. 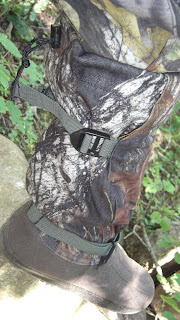 It also meant additional scent control, for those of you that hunt you understand scent control. Here is a link directly to the Camuks. We were greeted at the door with a smile and the service after that was everything you could want. While I was there for a specific product my wife and I enjoyed exploring the store. Very nice products and I've promised myself to go back for a pair of their -100F mits, a story for another time eh. Well I bought a pair of the Camuks and I've been wearing them off and on since then. Been kinda warm this year so until recently I had not had a chance to put some real mileage into them. We just had our first frost of the year two nights ago and we've been barely into the 50s since, with lows near freezing or so all week. I love this time of year! I'm a traditional bowhunter, have been for years. Love my longbow and cedars, stump shooting is one of my favorite hobbies. So I strapped up the Camuks and started my rounds. Covered about five or six miles a day for the past week. What follows are my initial thoughts and I am planning on a deep winter review as well. Just flat quiet, I figured they'd be quiet since they were very soft. They kind of envelop rocks, twigs and so on and they really let you feel the ground before you put all of your weight down. SUPER light weight too! They weigh 1.37 pounds each, a far cry from the Schnee's at nearly 5 pounds EACH! The soles are, for lack of a better word, "gummy", traction was quite good. In addition the open tread did not pick up debris, mud simply sloughed off. The sole sort of just wrapped around objects, even if a twig or small branch broke it was muffled. 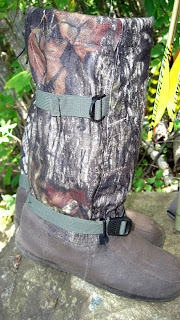 The uppers were a nice soft fabric, breathable but water resistant, much like a set of gaiters except they were soundless when they touched or rubbed against something. The wool insert is removable and every bit as heavy as the Schnee's version. I bought an extra set so I can trade them off every couple days, gives the damp ones time to dry, and at only $6.00 a set!!! I couldn't resist. They are also made in Ely Minnesota. I'm quite pleased with the boots so far, I'll definitely know more later in the year. 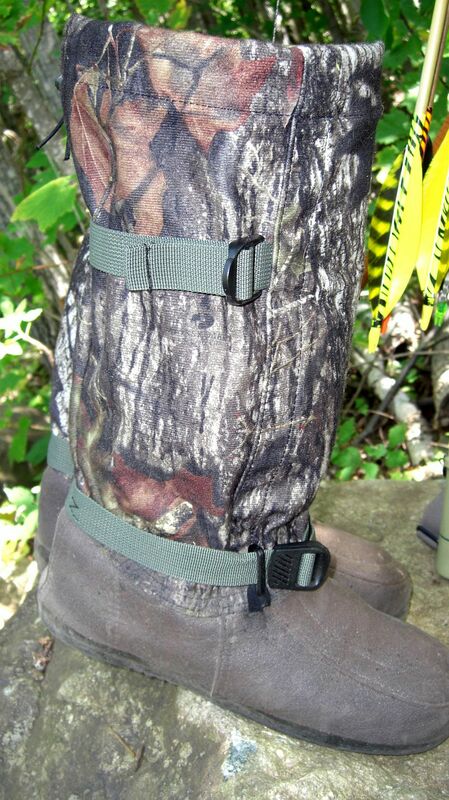 Our early season archery opens on September 18th and I will certainly be wearing these. As for the practice, it went well too! They also passed the up on the work bench in my shop test. Now that snow is on the ground I think you will like them twice as much. I wear mine from October to March for just about everything. From plowing the driveway and going to the store to hunting and fishing. Two things to know about them in the REALLY cold temps. 1. Goo soles freeze and can get slippery on icy surfaces. 2. Standing on Ice or pavement your feet get COLD! Stand in a snow bank for a minutes or two and they warm right up. Been wearing mine for about 8 years now and I think they are the best boots money can buy. With the amount of ice fishing I do they have only had water go through once but I broke through the ice and pretty much everything got wet. Good luck finding a cheap pair. I like mine, but WoW, they hurt the pocket book for us average retired guys.